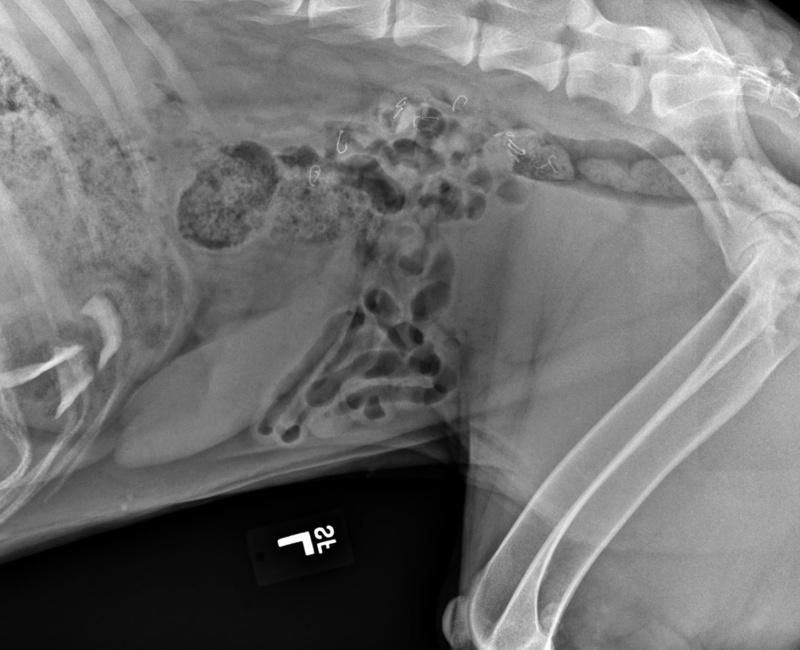 An X-ray shows the hooks of 15 fly-fishing fly patterns ingested – and later excreted – by a German shepherd in Pullman. Deborah Carlson’s German shepherd, Frieda, is obsessed by bugs, so much so that she recently swallowed more than a dozen fishing flies. So it may not be surprising the dog would be highly interested in imitation bugs designed to fool trout. But that was far from Carlson’s mind when she came home one evening recently to feed the dog and drop off some supplies she’d picked up for a fishing trip before heading back to work. When she returned four hours later, Carlson found Frieda had knocked her fishing supplies off the counter. As she cleaned up the mess she noticed a container of dry flies was empty. What to do? Carlson said the dog is a money pit. She suffers from epilepsy and is on medication and has had a few other health problems. Carlson works at Washington State University so she e-mailed a friend at the school’s College of Veterinary Medicine asking advice. She was told she should bring the dog in for X-rays so they would know what Frieda’s chances were. The scans showed 15 flies had made it through the dog’s throat, stomach and intestines and were “on the home stretch.” The 16th fly was never found. Frieda ended up passing all 15 flies without problem.